A POIGNANT history trip to the First World War battlefields left lasting memories for students at Haslingden High School. For Richelle Scott, 14, and John Fielding, 15, the trip held even more special memories as they had the honour of laying wreathes on behalf of the school at the Menin Gate. They also visited the different cemeteries where Allied and German soldiers were laid to rest. John said: “In the German Cemetery there was a mass grave and plaques with up to 40 names on them. It was a depressing place. “By contrast in the Allied Cemetery the white grave stones stood out and it was really well maintained. The stones also had a symbol on them to reflect the religion of the soldier in the grave. One grave was for a 14-year-old boy. “Even though it is 100 years since the First World War, in the cemetery it felt like those grave stones could have been placed there last year. “They are still finding bodies of soldiers in the fields in Belgium and every year they find another 30. They also got to explore what life was like in the trenches by visiting a preserved First World War trench. 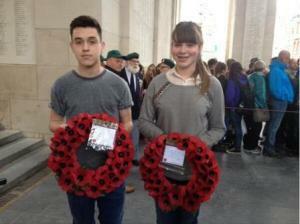 Honouring those who fell, John Fielding and Richelle Scott at the Menin Gate.